Prime Minister Benjamin Netanyahu took his get-out-the-vote push to the beach on Tuesday, imploring Israelis enjoying the Mediterranean waters to head to their local polling station. “Get out of the water, leave your homes and go vote for Likud,” Netanyahu told beachgoers in the coastal city of Netanya, according to a statement from his office. Netanyahu told bathers that if they don’t vote, “you will wake up with Yair Lapid as the head of a left-wing government.” He was referring to the no. 2 in the Benny Gantz-led Blue and White party, the primary challenger to Likud. The prime minister repeated the message in a campaign video filmed at the beach, where he spoke while surrounded by a circle of bodyguards as onlookers snapped photos with their phones. עכשיו בנתניה. צאו להצביע ליכוד!!! 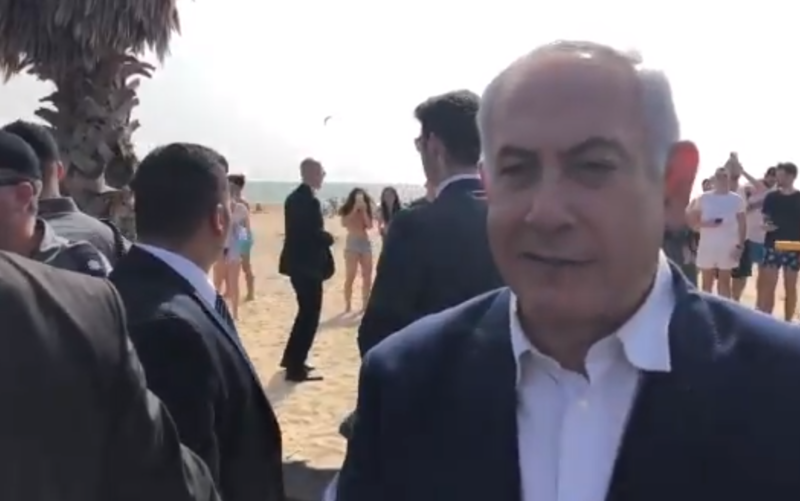 Netanyahu ditched his tie while at the beach, but did not wade into the waters as he did in 2017 during Indian Prime Minister Narendra Modi’s visit to Israel. He also accused Blue and White activists of invalidating Likud voting slips, a short time after Blue and White filed a complaint over its own slips being vandalized. Following his trip to the beach, Netanyahu was supposed to visit the southern port city of Ashdod, but canceled the campaign stop to instead hold an “emergency meeting” at his official residence in Jerusalem over what his Likud party said were low turnout levels at traditional strongholds for the party.